Have you ever been filled with nostalgia over a plate of food? 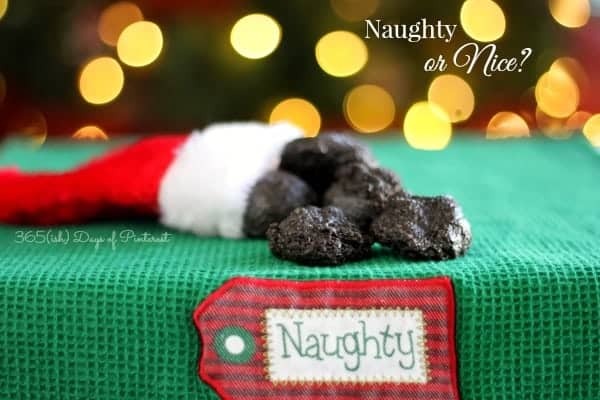 It may seem silly, but so many family traditions and memories revolve around food! The holidays are the perfect example of that. There are things that we have to eat every year or it just doesn’t feel like Christmas. 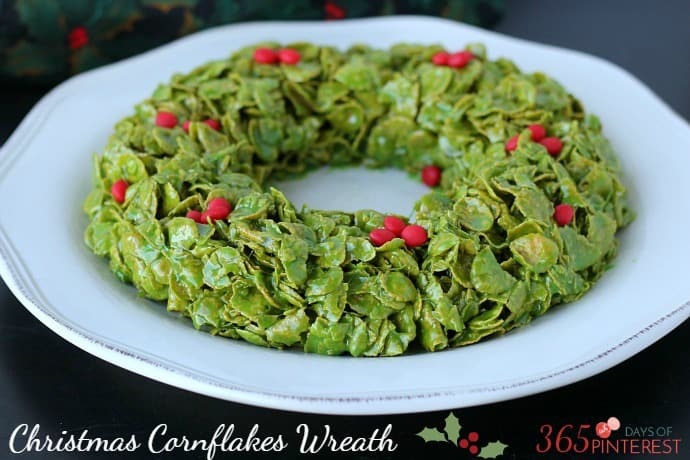 🙂 Growing up, one of the treats that always made an appearance was this Christmas Cornflakes Wreath. 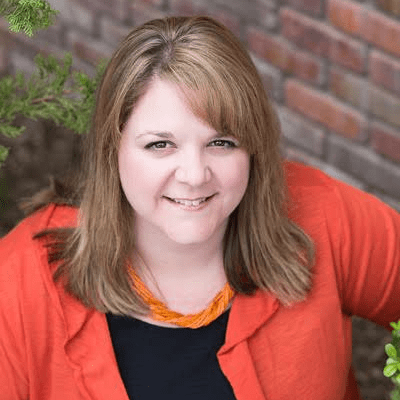 My mom used to be a direct sales rep for Christmas Around the World and would host parties at our house all the time. She would make this marshmallow treat for those parties and I would cross my fingers hoping that there would be some left for us after the party! 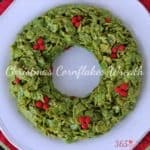 I’ve seen some miniature versions of this floating around Pinterest lately, but I prefer a large wreath that you slice up to serve. It looks great on the plate and it’s a lot easier to make! I put this together in less than 10 minutes and brought it to our Sunday School class activity the other night. It was quite popular and I heard several, “Oh, my mom used to make that!” comments. It was also extremely ooey-gooey which is just the way I like my marshmallow treats! I had to laugh a little at the color because I ran out of green food coloring and had to pull out some neon green food coloring gel to finish. So the wreath “leaves” are a bit bright. 🙂 Still…it’s fun, right? 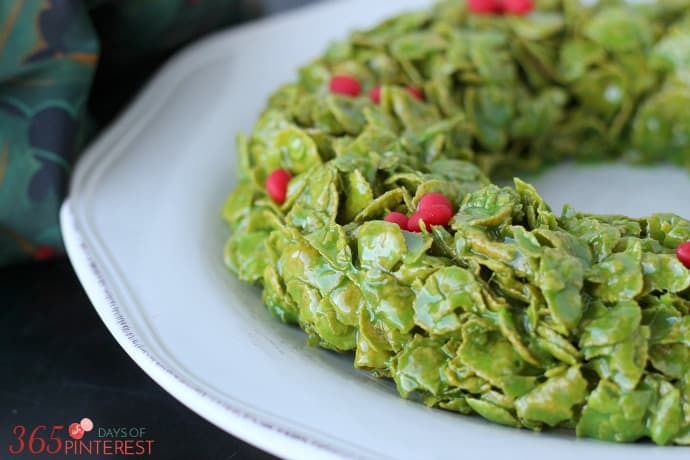 An easy, no bake recipe perfect for Christmas parties! In a large saucepan, melt the butter and marshmallows until smooth, stirring continuously. Add green food coloring and stir until desired shade of green is reached. Remove from heat, add cereal one cup at a time, stirring gently. Stir until cereal is completely covered with marshmallow mixture. 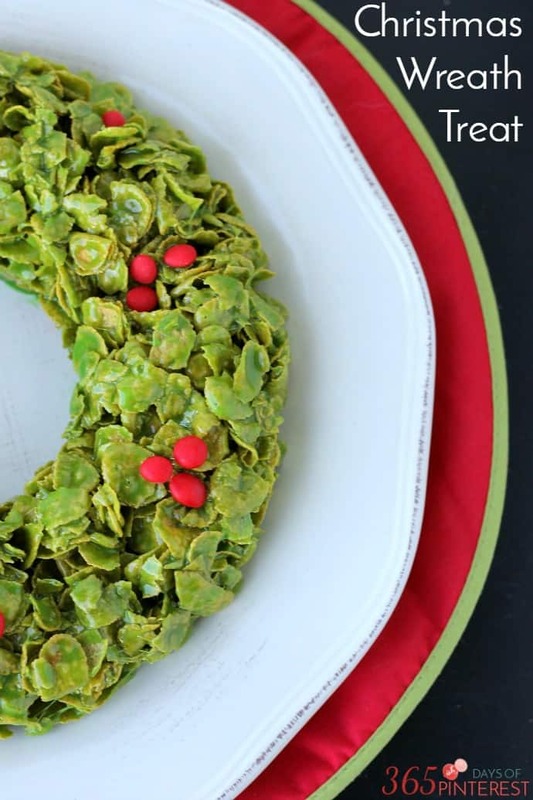 Scoop out onto a serving plate while still warm and form into a wreath shape. Add cinnamon candies in groups of three to mimic holly berries. Allow to cool and harden and then slice and serve! See? Easy peasy and pretty on the plate. Trust me, anyone can make this, and it’s a hit at Christmas parties! They are so sticky. How do you store it/them. Cover with wax paper and then wrap in plastic wrap. You can also spray some plastic wrap with non-stick cooking spray and lay that gently over the top as well. I used to make these all the time, but mine never looked quite so put together or cute.